One of the best ways to improve results in any sales organization is through a strategic, structured training program. What many sales managers find difficult however, is deciding on what training is needed, how much of it is needed and how frequently. Combine this with time constraints and many managers end up opting for the classic two-day, intensive sales seminar where your staff sit around listening to an ‘expert’ tell them stuff they either know already or will have forgotten by the time they get back to their hotel that evening. The bad news is, there’s no one-size-fits-all solution to sales training. Your team members most likely have individual strengths and weaknesses and different levels of experience, so sending them all on exactly the same course may not only be a waste of money, it might end up demoralizing the better performers. The good news is, with just a little strategic planning, you can develop a program that will not only move your company’s bottom line in the right direction, but will also help you retain your best salespeople. Do you really know what your team needs? Before you start you’ll need to do some housekeeping. It is important that you take the time to honestly assess your team’s strengths and weaknesses, the gaps in their knowledge, both collectively and as individuals, and the needs of your company. Are you losing deals due to a lack of product understanding? Is your sales process broken somewhere? Do they have the necessary skills to use the software or equipment you’ve provided? A deep dive into your sales statistics over a significant amount of time will help you immeasurably, but it is even more important that you talk to the individuals in your team. Where are they experiencing issues? What do they feel they lack? Speak to each member individually to assess their specific needs. OK. So now you know what is needed, or at least what you want to achieve. So how do you ensure that the training you’re about to conduct is actually effective? There are some skills that transcend industry, product or sales methodology. Ensuring that your sales team is well-versed in the basic foundations of successful selling is something many managers overlook, as are the practicalities of simply navigating the tools and systems your salespeople are expected to use. Do they really know how to use the software you’ve provided for them? You’d be amazed at how much time you can save by simply enabling your team to spend less of their working day on basic admin or technical tasks. Contrary to some claims, the email is far from dead as a selling tool. Does everyone in your team understand how to compose an effective, professional cold email or client response? Does your sales team make cold calls? Do they know the best practices? There are many great training programs available online covering these basic skills. You’d also be surprised at how many salespeople don’t fully understand the product or service they’re supposed to sell. You may need a more effective onboarding schedule for new staff or some refresher courses for the old-timers, especially if you have a product that constantly undergoes development or improvements. Shipping your entire sales team off to a training course is simply not practical, as this means your sales process stops for the duration of this session. This approach is also predicated on the assumption that all of your team members have exactly the same needs. Smart companies have discovered the beauty of online training as it allows convenient, trainee-chosen scheduling and also means the training content can be chosen separately for each individual team member and that they can move at their own pace. So if Sally struggles with cold calling and Tom has no idea how to use a CRM, you can work on fixing these gaps in their knowledge. Sit with each team member and craft a personalized training schedule that speaks to their specific needs, as long as these align with your broader goals. Research has shown that without systematic, regular learning and reinforcement, approximately 50% of what people are being taught is forgotten within five weeks. Within 90 days, 84% of what was initially learned is lost. If you’ve ever sat through an intensive, three-day training seminar you know how tedious and unproductive they can be. Even when people find both the presenter and the topic incredibly fascinating, they generally have an attention span of 7-10 minutes. Should they find both boring, they could lose interest in as little as 7 seconds. You need to focus on the regularity of training rather than intensity. Your team will gain more knowledge from a 30 minute a week session over three months than from one six-hour cram session. 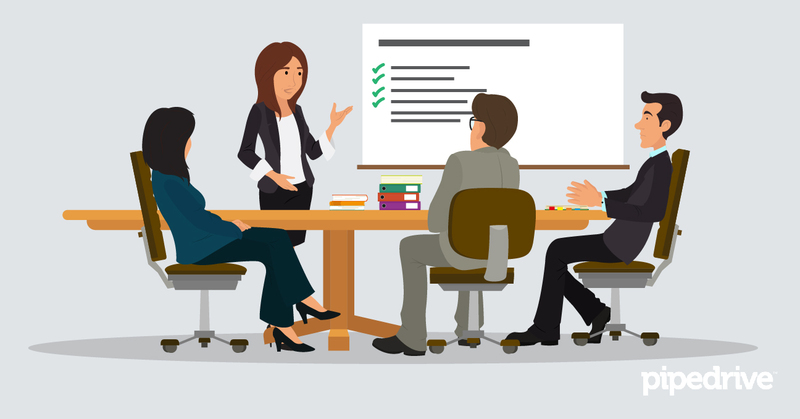 It is vital that any training your sales team undergoes has a strong practical side and that this relates specifically to your own company, sales process, and product or service. When people notice an immediate positive impact on their daily experience, it becomes much easier to keep them motivated to complete a lengthy training schedule. This also ties in with point one above. You’ll often reap the largest rewards simply by training your staff to effectively use the systems and tools that are already in place at your company. If you manage to get your team to the point where they enjoy using the tools you give them, you will greatly increase productivity and the quality of records inside your business. Sales is the ultimate results-driven activity, and this approach should also underpin any training program you develop. Look at the data regularly rather than just going on subjective feedback. Is the training actually bringing the results you expected during planning? Your team may be loving their regular seminars on the importance of posture and a nice view while conducting a sales call, but if there’s no change in your results you’re most likely wasting everybody’s time. Clearly set out and agree on the expected results with each team member. Bringing in measurability is both a great motivating factor and a tool to create a strong sense of achievement. Your team has differing skills and experience levels, and this can be used to your advantage. The buddy or mentoring system is proven to work, especially when your sales process is a complex one. Cooperate with your senior staffers to develop a training schedule that can double as an induction program for new employees and make sure you pair new or inexperienced salespeople with a mentor within the team. Transferring and sharing knowledge in this way is highly effective and is also a fantastic way to discover the weak spots in your sales process. Newcomers tend to question processes that old hands may see as ‘just the way we do things’. Always remain mindful of point 3 above though. You don’t want your best salesperson spending most of their time training rather than selling. You need to schedule regular one-on-one feedback sessions with your sales team and really listen to their feedback while supplying yours. Group sessions may save time, but people are often reluctant to admit shortcomings or failures in a public forum. It is also important that you put in place a reward system and it doesn’t always have to be a financial one. Simple praise and acknowledgment of improvements in performance will make people feel valued and inspire them to keep going, especially if this is done publicly. Of course, a monetary bonus system won’t hurt. Sales training will never be complete, and you need to embrace this fact. Creating a culture where learning and improvement are recognized and celebrated is one of the most important parts of successfully running a modern sales team. Good luck, and happy training. Lead Management: Do You Need a CRM Tool to Deliver the Goods?